Successfully Added Long Range Bluetooth USB Adapter (Desktop PC / Laptop) to your Shopping Cart. High Speed Long Range Bluetooth USB Adapter (PC/Laptop) is your connection to a whole new world of possibilities. Let's get right down to it. Here's why this product is so amazing. It adds Bluetooth functionality to your PC, notebook, laptop, or netbook! 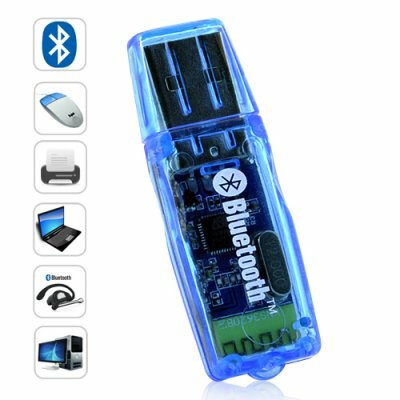 Bluetooth is a really easy and inexpensive technology to wirelessly connect various electronic devices to your computer. For example, easily transfer MP3s between your computer and Bluetooth-enabled cellphone. Don't have a Bluetooth cellphone? Consider Chinavasion's new CVDQ-M43 dual SIM, quad-band flip phone. As a student or business person, easily transfer notes and files from your PDA to your computer. Transfer photos from your digital camera or videos from your camcorder to your PC with ease, but without the use of wires. This is a real bonus for all your Flickr fans out there! Better yet, Bluetooth connect your printer to your computer so you don't have messy tangled wires running everywhere. This is especially useful because it allows you the freedom to customize your workspace and unchain your computer from your printer. Do you Skype? Now you can use a wireless headset to talk to friends and family. Imagine the freedom of walking around the room with two hands free while you Skype. Do some laundry or make a peanut butter and jam sandwich! Are you into Counterstrike or World of Warcraft? Up your game by using a Bluetooth wireless headset, mouse, and keyboard. Free yourself from the tangle of cords snaking across your desk and focus on what's important: fragging the living pixels out of your enemy! If that weren't great enough, here's something that most people never think to do with Bluetooth but is it's most powerful feature: you can actually form networks and exchange data with other Bluetooth-enabled computers. Think about it. No spending hours messing around with routers, hubs and setting IP addresses! This is great news for an informal home network or a small business without the resources to hire a dedicated network administrator! Don't wait any longer. Hit the "Add to Cart" button and improve the way you live, work, and play right away! Brought to you by the leader in wholesale direct from China electronics - Chinavasion. Though minimum order quantity is 5 for this product, please contact customer service if you wish to purchase only one unit contingent upon another Bluetooth product purchase like a cellphone for example. Connects to the following types of Bluetooth devices: Cellphones, Digital Cameras, Video Camcorders, Printers, Headsets, Mice, Keyboards and more. Transfers the following types of files: Audio, Video, Software, Photos and more. Can you really connect devices at a distance of 25 meters? Older Bluetooth adapters used to be limited to connections of a physical distance between objects of roughly 10 metres. Under actual testing conditions in which we experimented with connecting a Nokia 6300 cellphone with a PC, bluetooth pairing was achieved even at distances greater than 25 meters. But then we ran out of room and it was too hot to go outside! I hear the term "pairing" used a lot in relation to Bluetooth. What is pairing? Pairing, bonding, and connecting all mean the same thing. Using Bluetooth, when you try to connect two devices, you can have device A initiate contact or device B. In either case, the second device is prompted to accept or reject the connection. Upon acceptance, the two devices are connected wirelessly. What types of cellphones have Bluetooth functionality? Pretty well all new (within the last 5 years) cellphones have Bluetooth functionality. You can usually see the option in your settings menu. Some phones have a Bluetooth icon off the main menu. This is certainly true in the case of the major brands like Nokia, Motorola, Sony Ericsson, and Samsung. This is also true for Chinese made cellphones. In fact, since it's introduction more than a decade ago, Bluetooth technology has become a generally accepted form of wireless connection between consumer electronic devices. Nice build qualty, works well. Prompt delivery, I will be buying more products from chinavasion, good company to do business with..
hi, i received the blue tooth dongles today they seem to be good and the packaging was very good. the only thing bad i would say was that where i live there is no UPS centers with in 20km but there is 4 Australia post places with in 10km. and we missed deliver so we had to drive up there but the rest is good. i bought 2 of this device and one of them works perfectly and the other one aslo but the software cd was diffrent from the other so i hade to install it from the other cd. for the rest this device is great item.